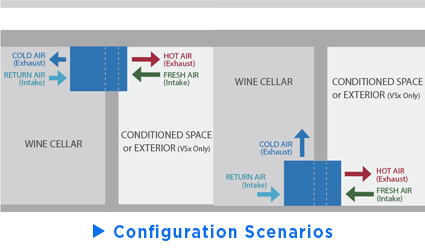 CellarPro's 8200VSx cooling units (1 Ton Nominal) are suitable for external installations from 20F to 110F in residential and commercial wine cellars up to 2,200 cubic feet. The 2,200 cubic feet cellar size assumes that the cellar is constructed with insulation of R19 or better in all walls and ceiling (ie no glass or uninsulated concrete), the cooling unit is not ducted, a setpoint of 55F inside the cellar and ambient temperatures up to 85F outside the cellar. Performance testing shows that this unit maintains optimal cellar temperature and humidity conditions in extreme conditions up to 110F more effectively than similar units from competing brands. 8200VSx units also are significantly quieter than comparable units from other brands. Visit our Learning Center for data tables, performance charts and product comparisons among different brands. 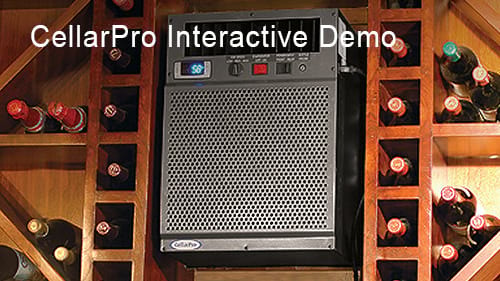 CellarPro 8200VSx units are self-enclosed, fully-charged units designed to be installed through an external wall. 8200VSx units can be located remotely from the cellar with the addition of one of our front duct packages (however, the entire unit cannot be located in an external environment). Offered with or without insulated flex ducting, in a choice of configurations for low or high humidity conditions, our front duct packages allow these cooling units to be ducted up to 50 equivalent feet away from the cellar using 10-inch ducting. When calculating equivalent feet, each 90-degree turn counts for 8 feet. For remote or inaccessible installations, we offer a remote control display kit which is wired to the cooling unit and allows the digital display to be mounted inside or outside the cellar. 8200VSx units require fresh air intake at the rear of the cooling unit, and are designed to handle shaded environments ranging from 20F to 110F. For installation in environments below 20F down to -20F, it will be necessary to add our Fan-Cycling Switch (P/N 6972). The front of the cooling unit should never be exposed to temperatures below 32F. CellarPro 8200VSx Cooling Unit (P/N 14787). Designed for external installations, CellarPro engineered the 8200VSx cooling unit to provide maximum cooling power and adjustable humidity control for cellars up to 2,200 cubic feet. 8200VSx units are built with high-output Tecumseh rotary compressors and oversized coils for maximum performance in high-temperature environments up to 115F. These units also feature variable-speed fans with a low setting for quieter operation when conditions permit. Beginning with the 8200VSi cooling unit for interior installations, we've added to the 8200VSx an exterior weather hood, cold-temperature compressor heater, coated condenser coils, double-powdercoated exterior case, reusable aluminum filter and exterior-grade power cord. All air-cooled refrigeration equipment requires fresh air intake to dissipate the heat generated by the cooling unit. The fresh air intake CANNOT come from the wine cellar space - it must come from space outside the cellar. This unit can be configured to operate in extreme temperature conditions (-20 to 110F), with the rear of the unit exposed to shaded external environments. Dual high-output centrifugal fans come with variable speed settings for your choice of maximum cooling power at the high fan speed, or quieter operation (66 decibels) at the low fan speed. Excess condensate is managed with a high-capacity stainless steel drain pan, welded 1/2" drain line and 100W electric heating element with "On/Off" Control. Commercial-grade Electrofin coating protects the evaporator and condenser coils from leaks and corrosion. Temperature set point range is 47F to 62F when the cooling unit is properly sized. With dual power sources and a 10-foot power cord, the unit can be plugged into a receptacle from either the front or the rear of the cooling unit, providing flexibility for most installations. Our easy-access reusable aluminum air filter protects the condenser coils and increases the expected useful life of the cooling unit. Adjustable mounting brackets, included as standard equipment, ensure easy installation. CellarPro's 5-Year Standard Warranty, the most thorough in the industry, protects the unit against manufacturing defects. An optional Extended Warranty (P/N 1836) is available for additional protection. - Common dedicated 15-amp circuit is required to power the unit. Optional Extended Warranty sold separately. Compressor Heater #1727: protects the unit when installed in environments that drop down to 20F - INCLUDED. Duct Hoods (Cold Side) (#7408 for low-humidity environments or #7427 for high-humidity environments) and Kits (#14680 for low-humidity environments or #15088 for high-humidity environments): permits the cooling unit to be located remotely, up to 50 equivalent feet away from the cellar. Duct Kits are the same as Duct Hoods, and also include 2 x 25-feet of 10-inch insulated (R-6) flex ducting. Networkable Thermostats #27346 and #27310: connect your cooling unit to a networkable, wi-fi enabled thermostat (sold separately). Some limitations apply - read the networkable thermostat description for more information. Includes 10 feet of wiring. A: First, the background. Unlike our competitors, we build our cooling units with precision expansion valves, not cap tubes, which means that our cooling units aren't limited to a 30F differential between the desired cellar temperature and the ambient temperature. Cooling systems with expansion valves are much more precise than cap tubes, and much more sensitive to low voltage conditions, which is why our units require dedicated circuits. When we say "dedicated circuit", we mean that the circuit shouldn't have any items that require heavy draws of electricity - eg other appliances, vacuum cleaners, big-screen TVs, blow-dryers - on the same circuit as the cooling unit. Lighting, computers or other low-draw items shouldn't be a problem on the same circuit. Why does it say it can be installed in a "shaded" external environment? A: The intake temperature on the hot side of the cooling unit can handle temperatures up to 110F. When the exterior hood is in the direct sun, the hood can heat up like an oven, and temperatures quickly can exceed 110F. Therefore, the exterior hood should not be installed with direct exposure to the sun. A: These cooling units can be ducted up to 50 equivalent feet away from the wine cellar when used with our cold-side (front) duct hoods and kits. Remember that cold-side ducting must be insulated and additional load should be added to properly size the required cooling unit. Can I install the entire unit inside the cellar? A: If you want to install the entire unit inside the cellar, you should not purchase this unit, which is designed for exterior exposure. Instead, you should purchase the interior version, which can be installed completely inside the wine cellar when used with our hot-side (rear) duct hoods and kits, which allow rear supply and return airflows from a temperature controlled environment OUTSIDE the cellar to be ducted (with insulated ducting to minimize heat transfer inside the cellar) up to 100 equivalent feet (50 feet per duct). If I don't have sufficient space behind the cooling unit, is that Ok? A: The rear of the cooling unit generates hot air that must have sufficient space to dissipate, otherwise the unit will recycle its own hot air. Can I use the low fan speed setting on the cooling unit when the unit is ducted? A: Duct hoods and kits create additional static pressure and therefore require the use of the high fan speed to overcome the additional static pressure.